Florida was shut out Tuesday by the National Football League and Major League Soccer. The NFL awarded the 2016 Super Bowl to the San Francisco area and the 2017 championship contest to Houston, a little more than two weeks after a bill tied to potential state funding for the Miami Dolphins and an Orlando soccer stadium died in the Florida House. 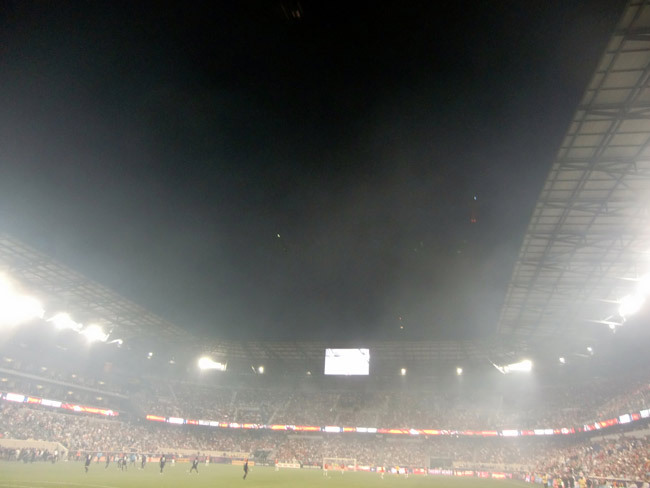 Early Tuesday, the MLS formally announced that New York, behind a partnership involving the New York Yankees and English Premier League powerhouse Manchester City FC, would be awarded the league’s 20th expansion club. Orlando City Soccer Club investor Flavio Augusto da Silva said, in a message on the team website, his team would begin an undetermined “plan B” to fund the new stadium, with the goal remaining to join the MLS by 2015. “We feel confident that once we figure out the finances everything will fall into place,” the investor said. For the Dolphins, the opportunity to host one of the upcoming Super Bowls was a goal while asking the Legislature to back a referendum that proposed an increase in the hotel bed tax and also to let the team apply for sales tax reimbursements, both in order to help pay for $350 million in improvements to Sun Life Stadium. Miami Dolphins owner Stephen Ross, a billionaire who has not advanced plans since the legislative defeat, had argued the Sun Life improvements — including a canopy to shield fans from the sun and rain — were needed to avoid a repeat of the 2007 Super Bowl in Miami that was played in heavy rain. “Today’s decision doesn’t dampen our enthusiasm to pursue Super Bowls in the future, since we are steadfast in our belief that those games are good for the South Florida community,” Ross said in a release that also congratulated San Francisco and Houston. Ross was less graceful May 3, when the Legislative session ended without any stadium funding proposal reaching the House floor. Weatherford on Tuesday said the stadium funding issue had “three strikes” against it: failure to get heard by the House Appropriations Committee; a lack of support from members of the Miami-Dade delegation; and 57 percent of the vote in Miami-Dade going against the sales-tax referendum. The results of the referendum – early voting was halted when the session ended – were not released until May 14. The Orlando City Soccer Club had counted on legislation to provide up to $30 million in state sales-tax subsidies to help build a $110 million, 18,800-seat stadium designed to entice the MLS to award Orlando the expansion franchise. As part of that package, Orlando City SC was to put up $30 million, with $25 million in tourist taxes coming from Orange County and $25 million in land and cash from Orlando. Orlando was never getting the next MLS team. League always wanted a second NY team. NFL just helping am owner get what he wants (stadium upgrades) by using Super Bowl as a carrot. I could care less about how badly Sun Stadium needs improvements, or that the Miami Dolphins want to host a Super Bowl game…….it’s not like the Dolphins will ever make it there! And Orlando has a hard enough time filling seats for Magic games, and I doubt anyone really knows the Solar Bears are actually a hockey team……..so how do you plan to fill a BRAND NEW STADIUM for a soccer team you might never even get? And you expect the tax payers to foot the bill for all of this luxury that maybe a few people could actually afford? Try lowering your ticket prices to the games for one, or better yet…..why not tax the heck out of these millionaire athletes and put that money towards funding the schools we are closing and the teachers getting fired? I would be all for a 5% tax increase on professional athletes, and use that money towards teachers and schools…….afterall without teachers, these “professional athletes” would not even be able to play football or baseball or whatever sport they play! Everyone knows how the jock-systems work in public and private schools. Football players and other athletes get passing grades regardless of how well they do in class…..if they even show up at all. Athletics bring money to school in greater numbers than does the marching band or drama club or the chess club………but get a D and you don’t participate. Get a D while playing football…….suddenly that is a C and you can play! Half of the kids today only go to school to play sports, and is the main reason a majority even go to college! You will never see the football program cut from a school to save money, but look out marching band! New uniforms for the band? NOPE….too much money. New tubas to replace the dented ones that do not sound right? NOPE…..not in the budget! New helmets for the football team? SURE! Let’s get two per player! One for home games and one for away games! New uniforms for the football team? SURE! Let’s throw in new practice uniforms too while we are at it! Football teams get everything handed to them…..while the band, cheerleaders, and other sports teams are out there at the local bank or grocery store parking lot washing cars to raise money! I say, let the football players take a few days out of their practice schedule and do the same thing! Any proposition by any sports organization to fund a new stadium or improvements to an existing multi-billion dollar stadium by that tax payers should never even be considered. These owners want it……let them get it on their own dime! I agree sports teams should pay for their own improvements. So should DIS – God knows they have plenty of money (how else could they afford drivers not to compete). We should also not be spending public money for tennis centers, arts centers, or museums. User fees and private funding should fund these projects.